The streets of Hartland were lined by hundreds of people on Saturday, May 1st, when May Day Carnival and fun fair resulted in a substantial sum being raised for the Recreation Centre Association. The procession was headed by the May Queen (Iris Jeffery) and her attendants were Pamela Hearn and Rachel Beer. 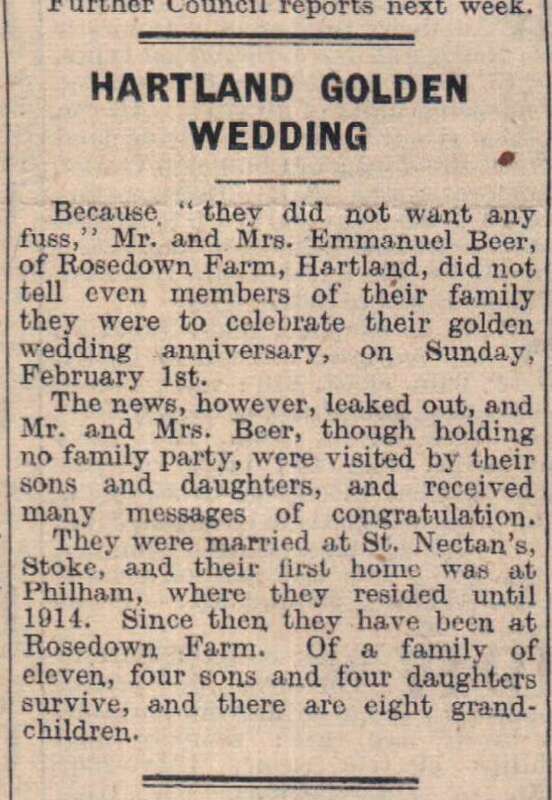 Because "they did not want any fuss" Mr. and Mrs. Emmanuel Beer, of Rosedown Farm, Hartland, did not tell even members of their family they were to celebrate their golden wedding anniversary on Sunday, February 1st. The news, however, leaked out, and Mr. and Mrs. Beer, though holding no family party, were visited by their sons and daughters, and received many messages of congratulation. The funeral of Mr Augustus Thomas Walter, a well-known Hartland farmer who died at the North Devon Infirmary, Barnstaple, following a long illness, took place at Hartland Methodist Church. Cremation followed at the North Devon Crematorium. Mr Walter, who farmed at Edistone Farm, Hartland, as did his father before him, was 70. He served in the Army in the First World War. The Walter family tradition with Edistone Farm, continued now in another generation, extends well over 100 years. Winners at four whist drives held at Hartland were: Mesdames M Beer, Cooke, Heard, Mugford, M Allin, B Jeffery, P O'Donnell, L Burrow, Miss R Westlake, Messrs Shute, S Johns and Burrow. Mesdames Littlejohns, E Westlake, O Westlake, J Mugford, S Prust, M Allin, J Heard, L Burrow and Shute, Messrs Squires, Allin and Jewell. Mesdames L Rowe, Allin, Cooke, M Jeffery, A Short, J Heard and Burrow and Mr D Rowe. Mesdames Walter, Vanstone, Beer, Littlejohns, Burrow, Miss R Westlake, Messrs Shute and O'Donnell. More parking space for Hartland – but not until 1965-66 financial year. Members of the Parish Council were told that the widening scheme for Gregory Terrace would not be implemented until then. Mr H J Harris contended that until this work is carried out no parking restrictions should operate in the main street. It was agreed again to press for the widening of the Hartland-Clovelly road at Rosedown, which, members unanimously agreed, was the worst spot on the road. A double wedding took place at St Nectan's Church, Hartland. The two brides, Miss Nancy Beer, youngest daughter of Mr and Mrs A L Beer of 1 Natcott Lane, Hartland and Miss Heather Dayman, youngest daughter of Mr and Mrs Dayman of 98 West Street, Hartland, are cousins. The Vicar of Hartland, Rev. F H Lockyear, officiated. The organist was Lorraine White. Returning to competitions after a gap of several years, Hartland Band achieved its first festival win ever. At the South West Brass Band Association's Spring festival at Barnstaple they were first in section three's test piece and second in the march. In addition, euphonium player Dave Webber won the soloist prize in his section and there was, unusually, a special mention for the band's percussion player, RAF man Peter Last. A reproduction of the new badge of the Royal Air Force unit stationed at Hartland Point, the use of which was sanctioned by the Queen last year. With the holiday season now in full swing the coastguards of rescue headquarters Hartland Point, who co-ordinate all rescue work between Padstow and Burnham, are facing their busiest time of the year. Most of the full time men are relative newcomers to this area, having transferred to Hartland following promotion in the past 12 months. The picture shows (left to right): Station Officer A Gwilliam, coastguards R Clarke, K Gaston, A Arden, B Reynolds and M Jackson, and district officer L Homewood. Women's Service: The interdenominational Women's World Day of Prayer was observed by a united congregation at the Methodist Church on Friday. This year's order of service, which is recognised by the women of 150 countries, was prepared by Queen Salote of Tonga shortly before she died. The local service was led by Mrs H R Niel and the reader was Mrs F H Lockyear. Hartland Darts: Bradworthy head the Hartland and District League. Hoops Inn are still propping up the 11-team league from the bottom with 60 points. We regret to announce the death, which took place at his home, Moreton, Bideford, yesterday (Thursday) of Sir Hugh Nicholas Granville Stucley, Bart. JP, of Affeton Castle, senior honorary freeman of the Borough of Bideford and one who, when he was accorded the honour 21 years ago, was described as a ‘A Bidefordian of Bidefordians’. A coming-out ball given by Sir Dennis and the Hon. Lady Stucley at Hartland Abbey on Saturday night for their youngest daughter, Miss Sarah Stucley, was attended by 300 guest who included Prince Michael of Kent. Prince Michael was the guest of Lady Margaret Van Cutsem at Castle Hill, near Barnstaple, at the weekend. 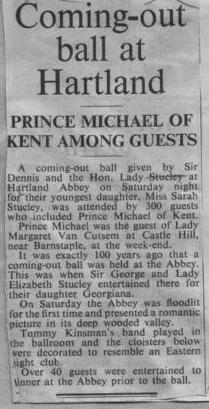 It was exactly 100 years ago that a coming-out ball was held at the Abbey. This was when Sir George and Lady Elizabeth Stucley entertained there for their daughter Georgiana. 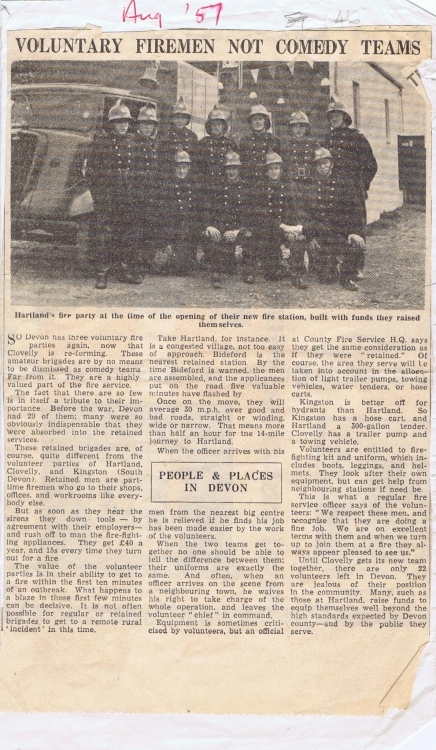 Hartland’s fire party at the time of the opening of their new fire station, built with funds they raised themselves. So Devon has three voluntary fire parties again, now that Clovelly is re-forming. These amateur brigades are by no means to be dismissed as comedy teams far from it. They are a highly valued part of the fire service. 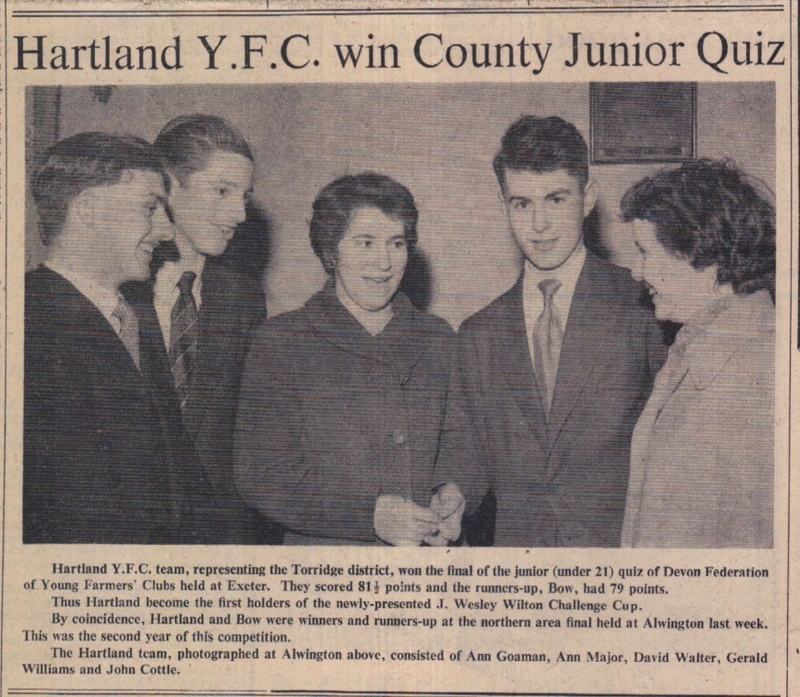 Pat, 17 year old third daughter of Mr and Mrs Lambert Dennis, of Berry Farm, Hartland, has won this year’s local carnival queen title as her sisters did in 1967 and 1969 respectively. Secretary in a Bideford agricultural firm, Pat qualified by selling a record 8,064 tickets to raise a total of £201.60 for carnival funds. It brought the sum raised by her sisters, Christine (Mrs David Powell) and Rosemary and herself to around £400. Pat’s rivals for the title, who became her attendants are 16 year old Christine Hobbs, of Beckland, and 15 year old Wendy Daniel, of Parkham. 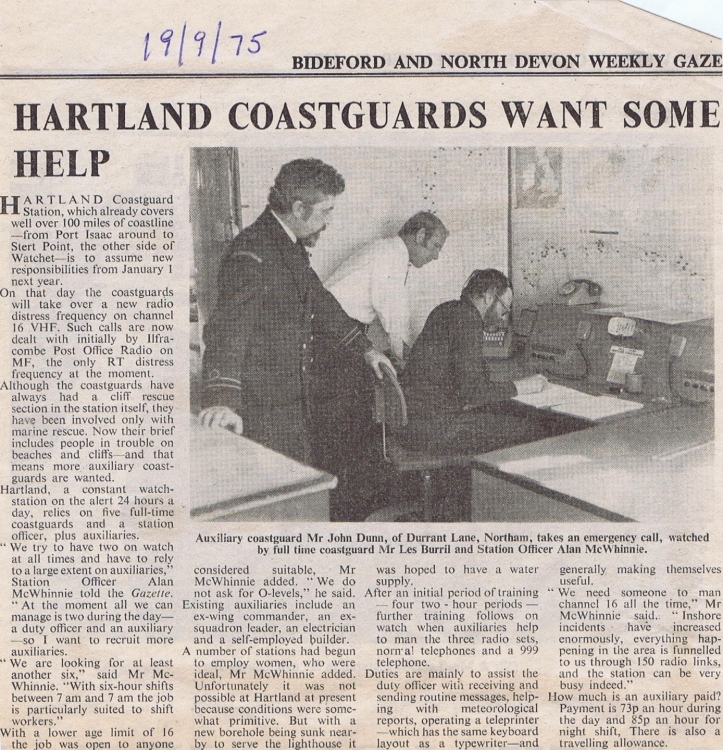 Auxiliary Coastguard Mr John Dunn, of Durrant Lane, Northam, takes an emergency call, watched by full time coastguard Mr Les Burril and Station Officer Alan McWhinnie. assume new responsibilities from January 1 next year. Miss Abraham, of 15 Park Avenue, Taunton, subject to a rent charge for the former owner’s life-time. At a Christmas party organised by the Hartland Over-60s Club Langtree widow, Mrs Mary Ellen Harris, met Hartland widower, Mr Edwin John Colley. Two car loads of produce from school festival. 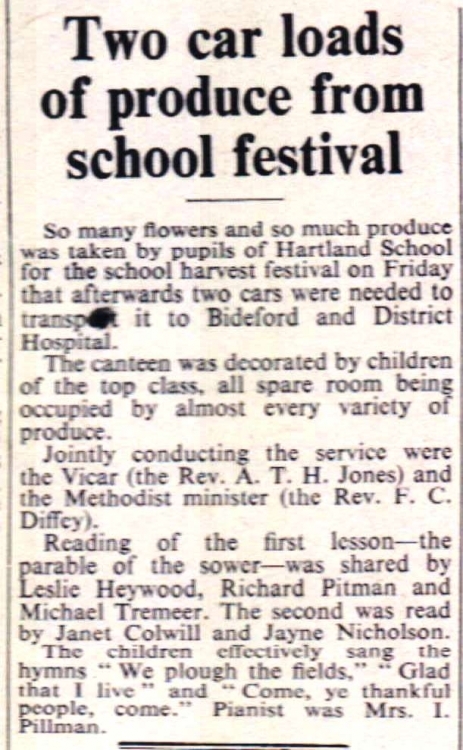 So many flowers and so much produce was taken by pupils of Hartland School for the school harvest festival on Friday that afterwards two cars were needed to transport it to Bideford and District Hospital. The canteen was decorated by children of the top class, all spare room being occupied by almost every variety of produce. Jointly conducting the service were the Vicar, the Rev A T H Jones, and the Methodist minister, the Rev F C Diffey. 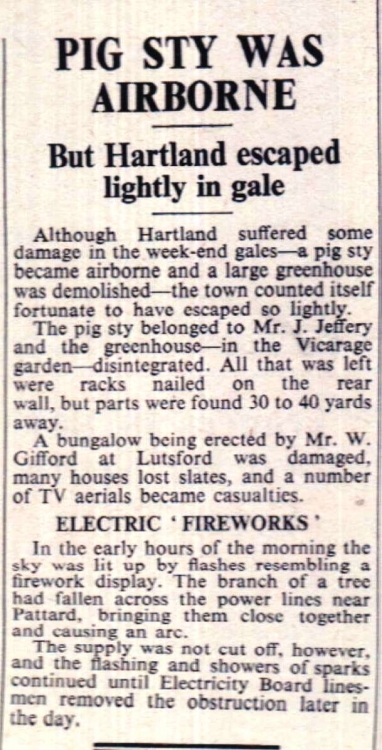 Although Hartland suffered some damage in the weekend gales – a pig sty became airborne and a large greenhouse was demolished – the town counted itself fortunate to have escaped so lightly. The pig sty belonged to Mr J Jeffery and the greenhouse – in the Vicarage garden – disintegrated. All that was left were racks nailed on the rear wall but parts were found 30 to 40 yards away. A bungalow being erected by Mr W Gifford at Lutsford was damaged, many houses lost slates and a number of TV aerials became casualties. April 5th was an important date for members of Hartland Women’s Institute. On that day their Institute reached the quarter century mark. To celebrate, a dinner was held in the Church Hall, attended by some 102 members together with members of the Meddon Institute who had been specially invited. Invitations were also extended to all past Presidents. Occupying a central place in the hall was the huge 36lb three tier birthday cake which was iced in the W.I. colours of green and red. Hartland's four almshouses may be demolished. 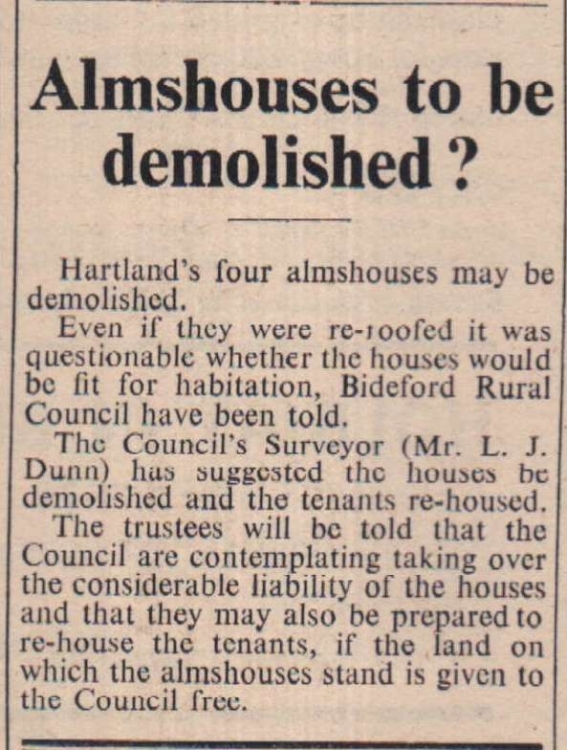 Even if they were re-roofed it was questionable whether the houses would be fit for habitation, Bideford Rural Council have been told. The Council's surveyor, Mr L J Dunn, has suggested the houses be demolished and the tenants re-housed. The trustees will be told that the Council are contemplating taking over the considerable liability of the houses and that they may also be prepared to re-house the tenants, if the land on which the almshouses stand is given to the Council free. Hartland Parish Council is supporting a move to get a resident policeman stationed in the township, as was the case until comparatively recently. They were asked to do so by Mrs Muriel Henwood who told them she had been ‘nearly killed’ in an incident just after 5pm a few days previously, and she was campaigning to have a policeman stationed in Hartland. The chairman, Mr Arthur George, said he understood there had been complaints about the riding of motorcycles, adding ‘I have to stand back in the hedge when I’m walking up the road and they come along’. Miss Joan Mary Weaver, who was married at the Church of the Sacred Heart, Bideford, on Saturday, made her own wedding cake. The bride is the second daughter of Mrs Anne Weaver and the late Mr Weaver, of Shamrock Cottage, Hartland, and the bridegroom Mr Sidney Jeffery, younger son of Mrs and the late Mr J Jeffery, 9 Northgate, Hartland. The service was conducted by Rev Father Ryan. Mr H Jarman was at the organ. What was the use of the government spending money putting up notices warning the public to make inquiries regarding any proposed development before they purchased land, if people did not read them? asked Mr J E Knapman, for Devon County Council, the planning authority, at a local inquiry at Bideford Rural Council offices last week. Hartland district doctor for the past 25 years, Dr Wilfred Somerton, will go off duty for the last time at midnight on December 31st. He is retiring to Rye, Sussex, just a quarter of a century after he removed to Hartland where his practice covers 144 square miles. Previously he was on the staff of a big military hospital in Bromsgrove, Worcestershire, having trained at Charing Cross Hospital and served as a registrar. The first father and daughter double wedding ever recalled at Hartland took place at St Nectan’s Parish Church on Saturday. Mr Arthur Heard Walter, of Stoke, Hartland, known to many friends as ‘Brown Jack’ from the horse he used to ride, married widow Mrs Edith Maud Hutchinson, who at one time lived at Clovelly. Mr Walter’s youngest daughter Doreen, who works as a machinist in Bideford and has been keeping house for her father, married Mr Stuart Hollingsworth, second son of Mr and Mrs Hollingsworth of 9 The Mount, Appledore. A founder of Hartland Town Band and choir master at Edistone Methodist Church for 64 years, Mr William Henry Walter, has died aged 80 at 11 Flexbury Park Road, Bude. Formerly of Parkham Mr Walter built a house at Tosbury Grove, Hartland, where he lived until recently. During the first world war Mr Walter, a wheelwright by trade, kept about 60 farmers in four parishes going with repairs to carts, wagons and other mechanisms. Last April Mr and Mrs Walter celebrated their 68th wedding anniversary. Hartland lighthouse on Tuesday night sent its warning beam out over the sea as it has done for many years, but for the first time it was operated by mains electricity. Engineers worked against the clock to complete the conversion on time, after having been held up by the non-arrival of equipment. Four members of the Hartland Auxiliary Coastguard rescue section have received 20 years long service medals. They are Messrs Reginald Johns, Wilfred Pennington, District Officer S R Richards, Kenneth Johns and Richard Wakeley. The death took place at his home, West Street, Hartland, of Mr Henry Prouse, at the age of 72 years. He was well known locally for his untiring efforts in connection with the Hartland Cottage Garden Society of which he was the vice chairman for a number of years. He was also a member of the British Legion from its inception and had also been a member of the Hartland Football Committee. For over 30 years he worked on the Stucley Estate. Hartonians are interested to learn that a native of the parish has just celebrated his 90th birthday. He is Mr John T Littlejohns, 8 Erme Road, Ivybridge, who was born at ‘Sunnyside’, Edistone, on January 1st 1867. Mr Littlejohns, who learned his trade as a carpenter, and after his marriage lived at The Cottage, Fore Street, Hartland, for some time was an auxiliary postman at Hartland before being appointed full time postman at Ivybridge in 1901. Dressmaking is one of the classes at Hartland Evening Institute held at the school. Mrs H George, Mrs J Turner and Mrs M Finch. After just under six years in the Coastguard service, all spent at Hartland, Mr L Homewood has been promoted to Station Officer at the Lizard. He and his wife came to the West country from Hull and he says “We have had a smashing time here”. He will be at the Lizard for five years but his ambition is ultimately to return to Hartland because “I like the country and I like the people”. Well known in the district for his riding school, Mr William J C Stone, 54 The Terrace, Hartland, has died at Bideford and District Hospital. A native of Hartland, he had farmed in the district all his life. Mr Stone, who leaves a widow but no family, was 62. The funeral at Hartland Methodist Church was conducted by the Rev C D Crisp. Mr W J Heard was at the organ. There was a large representative congregation present. Thirty of 36 children on Hartland Methodist Sunday school register have received Ned Prust Trust books for good attendance. Five of them were present on 50 Sundays last year. Denise Short, Liza Manley and Jean Colwill received their bars from overseas missions head offic for their efforts in raising money in 1972. Dr Donald Mackenzie, of Hartland, honorary medical adviser to the Clovelly-based lifeboat, the 71ft Charles H Barrett (Civil Service no. 35) has been accorded the thanks of the Royal National Lifeboat Institution inscribed on vellumfor the courage he showed while on service on Sunday, November 7th 1971. This is a tale of special interest to all who have pet cats. Mrs R Short, of ‘Pen-y-Brn’ Hartland, and her son and daughter, John and Gloria, spent a whole morning last week looking for their cat, Tinker, who, unknown to them, decided to go on a 400 mile joyride for the day. Hartland Point is placed 13th in the 'top 20' of the Royal Air Force 'sunshine stakes' for 1966. Hartland Parish south side particularly hit. Hartland parish has experienced its severest winter weather since 1947 over the past week or so, indeed, some say the conditions are worse than they were eight years ago. The two-hour fall of snow on the 20th was only the prelude to what was to come on the 23rd. Mr R Fisher, one of Hartland’s mail van drivers, could only get as far as Dadworthy Hill, one and half miles south of Hartland. Wearing full ceremonial dress of the Royal Marines, Mne John Walter, son of Mr and Mrs A H Walter, Church Cottage, Stoke, Hartland, was married at St Mary’s Parish Church, Gillingham, Kent, on Easter Monday, to Miss June Camille Bickell, daughter of Mr and Mrs J H Bickell, 33 Livingstone Road, Gillingham, Kent. For the third successive year Hartland children carried off the shield at the Bude Methodist circuit youth council’s seventy youth eisteddfod. A total of 21 Hartland children, aged six to 14 years, were responsible for 123 entries and achieved the massive total of 1,744 points. Providence, one of the smallest schools, runners-up for the past four years, were pushed into third place by Morwenstow. Hartland results: Jennifer Allin; Hazel Bragg; Martin Colwill; Dwayne Heard; Wendy Heard; Alison Manley; Patrick O’Donnell, Sandra O’Donell, Andrew Prouse; Denise Short; Kenneth Sluggett; Jennifer Thorne; Tracy Thorne. Decision of Bideford Rural Council not to support a protest by Hartland Parish Council at the action of local education officials in ‘causing alarm to parents’ on the matter of school transport, had been criticised, Mr S A Brimacombe told the Rural Council. A demonstration of potato spraying was given in Mr William Jas Pillman’s garden on Tuesday evening, July 2nd, by Mr A Richmond, a representative of the Food Production Department, who some time ago lectured on the subject in the school-room. Less than a dozen attended. The bell of a ship which sank off Hartland during the Second World War now sounds ‘time’ at a local inn. In December 1943, the 397-ton Florence Reynolds sank after a collision 10 miles west of Hartland Point. Last year the ship’s bell was found at a spot near the cliffs between Spekes Mill and Welcombe by Mr Clifford Prouse, of Greenfields, Baxworthy, Hartland. Now the bell hangs in the bar of the Westcountry Inn on the main Bideford-Bude road. While Jeremy Mugford was working in Ball Hill, Hartland he discovered a brick which his grandfather, William Mugford had written on 50 years before. The wording 'William Mugford, Builder and contractor, Ball Hill' was well preserved. Many competitors seized at Hartland Carnival a chance to air local grievances. Welcombe’s long awaited and, so far, non-existent electricity supply and the local school rumpus were just two of the topics depicted. So dense was the crown in the Square that when the Carnival Queen came to present the prizes many of the winners were unable to reach her float. Gary Meaker, 14 year old son of a Customs Officer, dashed a mile-and-a-half on his cycle to give the alarm when two women, two children and two dogs were in danger of being cut off by the rising tide at Hartland on Sunday. Soon afterwards all were lifted to safety by a rescue helicopter from RAF Chivenor. End of term at Hartland School brought the annual prizegiving, the awards being distributed by the headmaster, Mr E H Cross. Class I – Norman Bolton, Loraine Slee, Barbara Noble, Claire Morriss; Class II – Phillip Symonds, June Pengilly, Lynda Downie, Nicholas Slee, Gregory King; Class III – Peter Law, Christine Hobbs, Stephen Colwill, Patrick Murray; Class IV – Gerald Squires, Stephen Gifford, Charles Conibear; Class V – Norman Johns, Carol Davey, Leslie Heywood. Special prizes for work done at school camp – Jill Dawkins, Sheila Winter, Michael Tremeer. On Saturday morning Hartland had its daily papers brought in by improvised sledge. Early buses from Bideford were unable to reach Hartland owing to icy conditions on steep hills on the last stretch of the journey. On being informed of this, local newsagent Mr Henry Mitchell went out to bring in the papers. Using a tea chest as a sledge he dragged them the 1 1/2 miles to his shop. It took just over an hour. All these gaily decorated Christmas cakes will be adorning tables in the homes of pupils of Hartland All-age School this year. The cakes were made by girls between the ages of 11-plus and 14 as part of their domestic science and cookery training under their teacher Miss Jill Hopkins. Each year the girls make Christmas cakes which are the envy of the rest of the school. In the above picture, left to right, back row are: Jane Hooper, Joyce Goaman, Susan Dayman, Nancy Beer, Heather Dayman, Joyce Colwill, Janet Heart, Joyce Pomeroy, Rosemary Vanstone. Here, in the smiling greeting of Hartland's Grand Old Man, 91 years old Mr Daniel Headon, better known to many as 'Uncle Dan' is the spirit of the British countryside exemplified. Hardly a day passes, wet or dry, but Uncle Dan can be seen out on the main Bideford-Bude road for this three or four mile walk often carrying a large bundle of firewood as he makes his way home to ‘Highlea’, Baxworthy Corner, Hartland, where he lives with his son and daughter-in-law. Hartland YFC team, representing the Torridge district, won the final of the junior (under 21) quiz of Devon Federation of Young Farmers’ Clubs held at Exeter. They scored 81½ points and the runners-up, Bow, had 79 points. Thus Hartland become the first holders of the newly presented J Wesley Wilton Challenge Cup. By coincidence, Hartland and Bow were winners and runners-up at the northern area final held at Alwington last week. This was the second year of this competition. The Hartland team, photographed at Alwington above, consisted of Ann Goaman, Ann Major, David Walter, Gerald Williams and John Cottle. Kenneth Hall, son of Mr and Mrs G F Hall of 5 Coastguard Cottages, Hartland, recently won one of three awards given annually to boy entrants into the Royal Navy. He is now at HMS Collingwood. A Naval officer is attending Kenneth's old school, Bideford County Secondary, to present a gift of books.